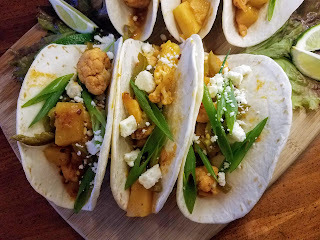 Our CSA adventures continue, we already had the ingredients to make these tacos so we added the green onion from our CSA basket as a garish. There's a great Modern Mexican restaurant near my office that serves tofu tacos al pastor. The protein in tacos al pastor in marinated in chilies, spices, and pineapple. The restaurant version that I like is also served with thinly sliced jicama for crunch, but in this version there is cauliflower in place of lamb in addition to crumbled feta cheese to help cut through the heat. 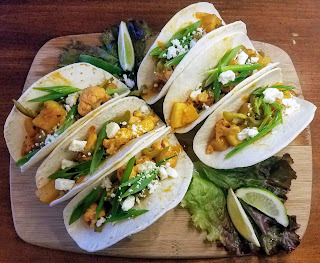 We both enjoyed the tacos, they are going to be spicy and the jalapenos can certainly be optional if you want to temper some of the heat from the sauce. Slightly adapted from Half Baked Harvest. 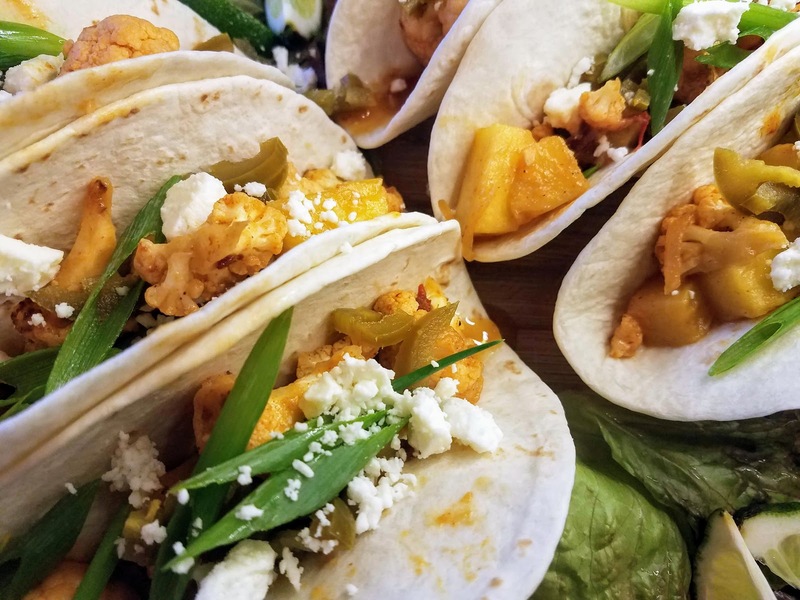 In a blender or food processor combine the garlic, chili powder, paprika, chipotle chilies, lemon juice, vinegar, water, and 1 cup of the pineapple chunks. Blend until completely smooth. Set the pineapple sauce aside. Heat a large skillet over medium heat and add the two tablespoons of olive oil. Add the cauliflower florets and diced onion, cook for 12-15 minutes or until the cauliflower is fork-tender. Reduce the heat to low and stir in the pineapple sauce from the blender along with the remaining pineapple and the diced pickled jalapenos. Simmer for 8-10 minutes, until the sauce has reduced and is coating the cauliflower. Divide the contents of the skillet among the tortillas, drizzle with any remaining sauce, top with feta cheese and green onions, and serve alongside lime wedges.